Designed for the global electric power & energy industry, POWER WEEK provides 5 days of networking opportunities, consisting of 2-day conference as the focal event, 3 workshops, 2 supplementary masterclasses, multiple case studies, expert views, and valuable insights on market outlook. Meet your industry peers from electricity regulators, national power companies, renewable & IPPs, investors and suppliers - all at one platform. It would serve as an opportunity to engage with top industry players from around the globe. With the vast range of participants at this exclusive event, learn about the success strategies and pitfalls of well-known power projects, through our intense case studies. With valuable insights on policy & regulations, technology innovations for generation / transmission / distribution, environmental impacts, fuel supply sources, renewable / hydro / nuclear / gas to power developments, power trading, IPP projects, investment & financing, power contracts & negotiations and many more from C-level expert speakers & attendees, POWER WEEK is certainly an event not to be missed! Mathias Steck, Executive Vice President, DNV GL Energy, Singapore etc. POWER WEEK provides a great opportunity to network and create new business partnerships that would boost your business. Meet your industry peers from electricity regulators, national power companies, renewable & IPPs, investors and suppliers - all at one platform. It would serve as an opportunity to engage top industry players from around the globe. 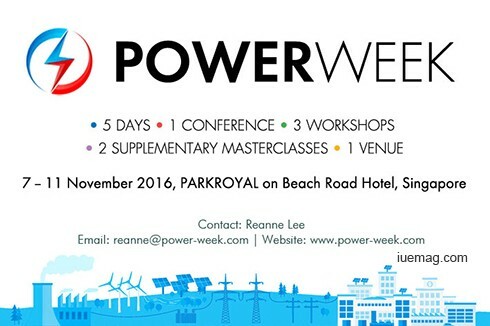 POWER WEEK is certainly an event not to be missed! Any facts, figures or references stated here are made by the author & don't reflect the endorsement of iU at all times unless otherwise drafted by official staff at iU. This article was first published here on 28th June 2016.